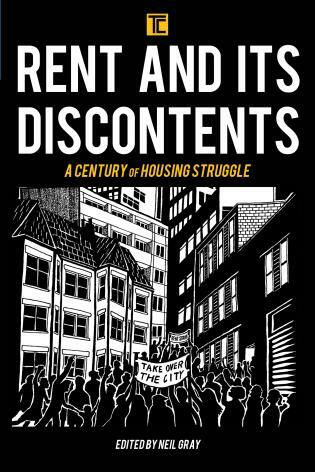 Joey Simons (Living Rent Tenants’ Union) interviews fellow Living Rent union member, Neil Gray, author of Rent and Its Discontents: A Century of Housing Struggle (2018). JS: The book has had a successful reception so far, with a packed launch event in Glasgow, and a symposium on the problem of rent at Edinburgh University with Living Rent organisers and other contributors. Could you speak firstly about its genesis. You mention in the introduction that although there was some renewed interest and public events around the centenary of the rent strikes in 2015, but that there was little in the way of new housing analysis generated. In an account of rent strikes in the Gorbals in the 1970s, Richard Bryant talked about how for many tenant leaders the historical experience of 1915 could be both inspiration and a ‘powerful source of political self-paralysis’, considering the absence of many of the key conditions which seemingly made the rent strikes so effective. What new analysis has the book brought? What do you see as the fundamental relevance of 1915 to today? NG: A take home message of the book is that housing reform has been far more dependent on collective tenant organisation than benevolent policy by allegedly enlightened leaders. The book was originally intended as tenant ‘history-from-below’, both a marker of the centenary of the 1915 rent strikes in Glasgow and a prompt to deepen our understanding of the housing question, as famously posed by Engels in the early 1870s. My feeling was that most accounts circulating at the time of the centenary were happy just to rehash, in lesser form, the key contributions by Joseph Melling, Sean Damer and Manuel Castells in the early 1980s. In different ways, all these are excellent, but dramatic transformations in the political economy of housing since then must now be accounted for: the right-to-buy policy was initiated in 1980 and since then a host of policies—including most obviously ‘housing stock transfer’ to increasingly market-led Housing Associations, which I wrote about in a previous article for Bella Caledonia—has vastly reduced public housing in the UK. At the same time, the market-led ideology of home-ownership has become dominant and the private rented sector has increased rapidly in the last decade or so. Those writers could not possibly have envisaged such changes in the 1980s, so I felt there was a real need to re-assess the 1915 rent strikes again by way of the significant transformations in the economy over the last three decades and more. Castells, for instance, largely followed Engels to the letter when he declared housing as a secondary contradiction behind the wage-labour relation in the workplace. That is why he placed more emphasis on the workplace struggles in the munitions industry during wartime Clydeside as a reason behind the rent controls conceded after the rent strikes. But industry has been much reduced since then and industrial workers no longer have the same capacity to organise and enact social changes, so does that mean that housing struggle is now hopeless without the strength of workers’ organisation behind it? And since housing has now become so central to the political economy of the UK, can we still say that it is a secondary issue, or that it ever was? The quote you mention from Richard Bryant, who wrote a great pamphlet called The Dampness Monster about the under-acknowledged six-year rent strike in the Gorbals during the 1970s, is very interesting to me. I think that the historical experience of 1915 operates as a ‘powerful source of political self-paralysis’ only if we over-estimate the role of the industrial struggles on Clydeside in the success of the rent strikes. The threat of a general strike notice by the Govan Trades Council over increased rents—potentially involving up to 30,000 workers—was undoubtedly one of the major reasons that legislation over rent restrictions was hastily enacted. This fact is central to Castells claim in 1983 that the rent strikes were only a secondary contradiction for the working class at the time and that the real reason the rent strikes succeeded was because of a militant munitions labour force. Yet, there is no necessary relation between industrial threat and rent concessions. The labour threat was strategically vital to the rent strikes for sure, and there are potentially important lessons there for contemporary housing struggles in terms of merging workplace and social reproduction struggles, but organized housing struggle in and of itself was the indispensable force behind housing reform. Obviously, there would have been no rent concessions without rent struggles, yet this is in danger of being obscured by an over-emphasis on industrial workers’ power and influence. In my view, a continued stress on the role of organized labour for housing struggles is anachronistic, leaving us yearning forlornly for a workers’ presence that no longer holds the same power or capacity it did back then. The struggles of today must deal with the conditions of today. I also found a lot of the writing on womens’ organisation in the rent strikes during the centenary nostalgic and limiting. These women were not merely plucky gallus besoms but were absolutely central to the organisation of the rent strikes, in particular through the Glasgow Women’s Housing Association (GWHA). There has been a tendency to isolate and venerate certain leading figures, Mary Barbour being the most obvious example. There is no doubt that the contributions of Mary Barbour, Helen Crawfurd and others was influential and important but as the chapter in the book by Annmarie Hughes and Valerie Wright stresses, the rent strikes were organised by a broad current of militant working-class women at the neighbourhood level. What is crucial, I think, is to stress the radical behaviour of women organising collectively in that period, rather than romanticising only the exploits of an exceptional few. Also, the rent strikes can clearly be seen as an important gender issue per se and be taken as a key moment in the emancipatory history of women, but there is a danger, in my view, that celebrating women rent strikers for the achievements of women in general obscures the specifically working-class nature of those struggles and the particularity of their urban concerns. As Pam Currie notes in her chapter, many women rent strikers were active in women’s issues but the rent strikes were specifically based on the housing issue and I think much more could be done to understand these struggles as a struggle around material concerns in the arena of social reproduction more generally (understood not only as biological reproduction but the reproduction of the worker for the workplace and the reproduction of social relations through transport, housing, community, health and leisure). Writing in the early 1990s on women in the rent strikes, James Smyth put it well when he discussed these struggles as being borne from a ‘mass concern with the facts of everyday life’. Then, as now, the burden of social reproduction falls primarily on women and investigating this aspect of the rent strikes I think is potentially the most productive and resonant way to link the rent strikes with contemporary concerns. Finally, the book was my way of addressing a massive gap in the radical literature on housing struggles and housing movements. As most of the few commentators on this issue have noted, housing struggles have typically not been well supported institutionally and financially by the trade unions, whose concerns have been primarily in the workplace. It is hardly surprising that the mainstream media has ignored these struggles, but we need to question the Left’s general disregard or tokenistic attitude to them, especially since housing has become so central to national political economies across the world and since many of these struggles have been led by women. Not only that, even at the level of workplace bargaining there is little point in squeezing out wage gains from the bosses if these gains are simply lost at the level of consumption through exorbitant rents and housing costs. Thankfully, I think we are beginning to see housing being taken more seriously now as an important political and economic terrain. JS: To go back to your point about the tendency still to obscure the real centrality of women’s leadership during the Rent Strike, the book highlights the importance of ‘the politics of the kitchen’ and struggles around social reproduction more generally. We are trying to foreground these questions in Living Rent. What can we learn from 1915 today? NG: There are two strong chapters in the first section of the book on this question in relation to the 1915 rent strikes, and my own chapter also addresses this theme. It can’t be stressed enough that it was women who led the Rent Strikes, and women who forced the housing issue on the ground, even if strong support from other organizations, such as the Independent Labour Party (ILP) was crucial. In wartime, even more so than usual, the defence of the home against landlordism and the task of domestic reproduction fell on women and the vast majority of rent strikers were working-class ‘housewives’ whose actions were based on their everyday experience of tenement life. It is important to be aware of the material conditions that foster or constrain struggle: the tenement construction of much of Glasgow at the time meant that any defence of the home could easily become a collective act: each flat was part of a communal stair or ‘close’ with the sharing of communal features, such as wash houses and toilets, making contact and communication a regular occurrence. Much of the organization for the Rent Strikes was undertaken in ‘close committees’—‘two women for each close’—and ‘kitchen meetings’ with homes secured by women-led mass pickets and the forcible expulsion of factors where necessary. Again, it needs to be stressed that the rent concessions gained in 1915, which ultimately led to the provision of public housing in the 1919 Addison Act, may have been supported by labour organisation on the Clydeside but this should not obscure the centrality of women-led organisation in generating this outcome. Crucially, the ‘politics of the kitchen’ that emerged through the rent strikes broke down the traditional separation between public and private spheres. Glasgow Women’s Housing Association (GWHA), formed in 1914, organised large-scale public meetings and demonstrations, many of which were aimed at obtaining solidarity from the industrial workplace. Yet the GWHA was an autonomous women’s body both in leadership and membership, whose regular public meetings were held on weekday afternoons at 3pm, suggesting that day-to-day organization was geared towards the needs of housewives and the unemployed and not those in paid work. James Smyth has described the rent strikes as probably the most successful example of direct action ever undertaken by the Scottish working class, indicating the error of separating gender and class issues by both the traditional labour movement and the most regressive sides of identity politics. In my view, we have to be really clear: it is absolutely crucial that the specificities of how gendered subjects experience exploitation is addressed but it is also necessary to show how intersectional commonality can be achieved. Organising with difference is clearly a fraught subject that soon becomes very polarised and hyperbolic but re-examining the rent strikes is one way of finding clues for how those problems might be overcome in the present. As I said before, what is notable is how specific material concerns around housing and social reproduction were raised by women in the rent strikes—‘a mass concern with the facts of everyday life’. Understanding the different ways that we experience these issues and trying to find some commonality around them seems to me to be one of the lessons we can take from the rent strikes and the politics of the kitchen at that time, even if the material context we now face is markedly different. JS: The marginalisation of the rent strikes for a long time, even within writing on Red Clydeside, seems to be symptomatic of a wider neglect of working class struggles outside of the traditionally male-dominated workplace more generally. Are there any works in particular that you have found useful as both a housing scholar and activist, and which may be useful for others? What have been your theoretical and political influences in the book? NG: I should use this opportunity to nod to some of the writers, activists and scholars who have addressed the housing question from the point of view of tenants and residents. I mentioned Joseph Melling and Sean Damer already. Damer in particular has written many excellent accounts of housing and housing struggle in the West of Scotland context. In general, I would say that both Melling and Damer are very engaged with the gender question, in distinction to most male accounts of working-class struggle. Many people know about the 1915 rent strikes but few know about the Clydebank rent strikes which ran from 1920-1927. What Damer claims here is that while 1915 may have been pivotal to rent restrictions, these were only intended for wartime; it was post-wartime struggles like those in Clydebank, which are less celebrated, that helped retain rent restrictions against the best efforts of the state, landlord lobbies and the building industry. David Englander’s Landlord and Tenant in Urban Britain, 1838–1918, published in 1983, is also an invaluable account of housing struggles across England, Scotland and Wales whose remit goes well beyond that indicated in the title to include multiple largely unknown housing struggles across the 20th century. It is also worth noting that there were multiple rent strikes in Scotland beyond Glasgow. Tony Cox has a very interesting chapter in the book on the 1915 rent strikes in Dundee and Ann Petrie has also covered this period in The 1915 Rent Strikes: An East Coast Perspective, published in 2008. John Grayson’s excellent popular account from 1996, Opening the Window: Revealing the Hidden History of Tenants Organisations, is another under-acknowledged book that does much to fill in the gaps of housing movement history in Britain. Quintin Bradley’s The Tenants’ Movement: Resident Involvement, Community Action and the Contentious Politics of Housing, published in 2014, is another excellent account that takes seriously the political potential of tenants’ movements. Finally, I think the best recent book on housing and housing movements is In Defence of Housing by David Madden and Peter Marcuse. The primary focus is on the US but it is highly relevant to the UK. For me, it does the best job of recent books on housing in making clear the links between the abstractions of contemporary capitalism (mortgage-backed securities, bond financing and others forms of financialising housing) and the lived experience and resistance of tenants and residents in the homes that such abstractions target. The work of Desiree Fields has also been very useful for me in thinking through the possibility of a politics around the financialisation of housing. We’re running a reading group shortly with Living Rent on housing and financialisation where all the articles will be by female authors such as Fields, Kathe Newman, Rachel Weber and Melissa Garcia-Lamarca, as one way to address gender disparity in the writing on housing issues. At a wider level of abstraction, Henri Lefebvre, the French Marxist theorist of urban space, has been a major influence for me, particularly in his book The Urban Revolution, first published in 1970. Also, David Harvey, despite some reservations. Neither are really housing authors per se, though at times they address housing specifically, but rather theorists of urban space and specifically the impact of capitalism historically on urban space. For me, what is central to grasp politically is the transition from industrialisation to urbanisation historically and how this affects the current housing market, the political economy of land and public space more generally. Lefebvre developed the concept of ‘capital switching’ in the late 1960s to discuss how capital tends to switch from industry to the built environment, especially in times of crisis. I think it is not going too far to say that such crisis in industry is pretty much complete and that industrial crisis is no longer necessary to induce capital switching since the switch has already been made. We could also talk about a switch to financialised forms of accumulation since so much of that switch is bound up in real estate. But if the shift from industrialisation to urbanisation – in the UK at least – is pretty much complete, our politics does not seem to have followed. There are signs that a new urban politics may be emerging more now but one of the major themes of the book, as I saw it, was to take this switch more fully on board when considering the form of political practice that is necessary to challenge or overcome contemporary capitalism. In that respect, the work of people like Silvia Federici and Mariarosa Dalla Costa, albeit not specifically on housing, has been very important for me since it opens up the question of how capital operates outside the workplace and how it might be challenged on the terrain of social reproduction. Finally, the book addressed the land issue only obliquely, but what has become clearer to me during the research process is how important the political economy of land is to the housing question. A book destined to become seminal is The New Enclosure: The Appropriation of Public Land in Britain by Brett Christophers, published in 2018, where he cites some incredibly telling statistics: land assets accounted for 51% of the UK’s net asset worth in 2016 and the value of public land sold off since 1979 amounts to around £400 billion measured in today’s prices. Much of the value derived from privatising housing is in fact value derived from land costs, and much of the cost of contemporary housing arises from the land on which it sits. Land value accounts for an estimated 70% of the sale price of residential properties in England, for instance, up from an estimated 2% in the 1930s. For me, this transition in terms of assets is best understood by grasping how capital now increasingly targets the built environment rather than industry, and I think housing must also be grasped in these terms if we want to understand fully the political implications of the housing question. Without addressing the privatisation of land and its vital role as a repository for surplus capital and asset formation, there is unlikely to be a just resolution to the housing question any time soon. People like Andy Wightman have been banging this drum for a long time but there is a real need to address urban as well as rural land in this area. JS: You mentioned the need for class politics to make ‘the switch’ which capital itself has made into urbanisation. There has been a clear resurgence in housing activism over the past decade, with organisations like the Dublin Tenants’ Association, the London Renters Union, ACORN, and Living Rent all emerging. What do you see as the potential for such organisations to overcome the forces of decomposition which have so damaged the traditional workers’ movements, especially in terms of cross-tenure struggle? What marks out these organisations from previous incarnations of tenant struggle, in your experience? What do you see as the main possibilities and challenges for Living Rent and other tenant organisations in the current period? NG: First, I think it is important to say, certainly in the Scottish context, that the independent housing movement was largely moribund until the emergence of Living Rent, whose brief history you can read about here. Really, since the major campaigns against stock transfer in the 2000s, especially in Glasgow and Edinburgh but throughout Scotland too, apart from fairly sporadic and localised campaigns, the odd smaller anti-stock transfer campaign (including successful campaigns in West Dunbartonshire and East Renfrewshire which should be acknowledged here) and the Bedroom Tax campaign, there has been very little concerted, organised activity. The Bedroom Tax campaign, while clearly important, was ‘resolved’ at a policy level—I use scare quotes there because we should not forget that the ‘under-occupancy’ policy still exists and is merely being mitigated by the Scottish Government through discretionary housing payments. While this policy has been a qualified success in terms of protecting tenants from the worst inequities of the housing system, it did not alter the structure of the housing system and did not help build housing movement organisation for the long term. There are several interesting components of the new housing movements. Firstly, they often focus on the private rented sector (PRS), which has not been a traditional area of organisation for Scottish housing activists. This is probably because council housing levels in Scotland have historically been very high (61% in 1981 in Glasgow for instance) and because council housing struggles were able to draw on a high preponderance of working-class activists on housing estates/schemes with broadly the same tenure and landlord. At a political compositional level that gave such forms of housing activism some coherence, but this issue is more complicated now. The PRS is increasingly rapidly (now around 15% of all tenure in Scotland and around 20% in England, roughly equivalent to social housing levels south of the border). Council housing has been massively diminished, either through right-to-buy, mass demolition schemes or stock transfer to Housing Associations (HAs). In the latter case, HAs typically form their own tenant committees, which are roundly condemned by housing activists as toothless mouthpieces for the HAs rather than fighting units for tenants. So what interests me is that the new tenant movements (including Living Rent, of which I am a member) have re-booted independent tenant organisations and are now responding to the actually existing recomposition of housing experience and tenure that has occurred over the last two or three decades. Another key factor is the rise of the tenant union model: Living Rent Scotland became a union in 2016, and the London Renters’ Union was established as a union in 2018. What is important here, in the wider context of tenants being incorporated into HA committees and losing their independence, is that the union structure allows for genuine tenant self-sufficiency while also providing the resources to hire organisers and fight campaigns. Also, at least in the case I know best—the Glasgow branch of Living Rent— campaigns are predominantly built around member defence, direct action and the fostering of grass-roots agency as well as policy and lobbying work. What I see is a really genuine attempt to democratise the movement from within and build capacity across the membership. It is also notable that Living Rent learns through doing and through collective practical experience of different material issues, in distinction to some other organisations which ply a ready-made political line through hierarchical channels and tend to rely too much on charismatic leaders, leaving the organisations bereft whenever one of these leaders moves on or serious internal problems arise within that model. There are some very obvious and high-profile examples which I don’t need to name here. Moving forward, and here I speak for myself and not for Living Rent, I think the union, which emerged initially from the innovative Edinburgh Private Tenants’ Action Group (EPTAG) and the Scottish National Union of Students (NUS) has perhaps tended to focus too much on the private rented sector. To be clear, resources were initially quite limited and this focus has been a real strength: the private rented sector was largely ignored previously and has since become a potent site of organised discontent from tenants. But I think there is an increasing recognition that public housing must be addressed in order to fully challenge inequities in the private rented sector, since each tenure is shaped by the other. As Living Rent has developed capacity, built the membership and been in a position to hire paid organisers, the terrain of public housing looks set to be a more important issue for the group and current discussions centre around how a clearer policy might emerge on this issue. The beginning of Living Rent’s new neighbourhood branches (in Govan and Maryhill initially), I think, will help develop a more multi-tenure approach, which as Stuart Hodkinson, Paul Watt and myself note in the book, is becoming, by necessity, more typical for contemporary housing movements. At the same time, Living Rent has barely touched homeownership and the politics that might be required in this area. This, I think, is an important but under-researched area for housing movements, if not housing academics, more generally. In 2017, around 62% of all housing tenure in Scotland was in homeownership. While it is difficult to see how home-ownership can be tackled through housing activism of the kind typical in the public, social and private rented sectors clearly the ridiculously high costs of homeownership skew the whole housing market upwards. This issue would likely have to be addressed more at policy level, but since housing is so central to national political economies it will not be easy to shift anything on that terrain. Taking into account what I said before about the political economy of land, and since homeowners do not want to challenge their own interests, I would like to see the new housing movements, as their capacities increase, begin to address how the political economy of land intersects with homeownership and the social and private rented sectors. This by necessity will entail a deeper understanding of how contemporary capitalism works more generally, but particularly in the field of housing.